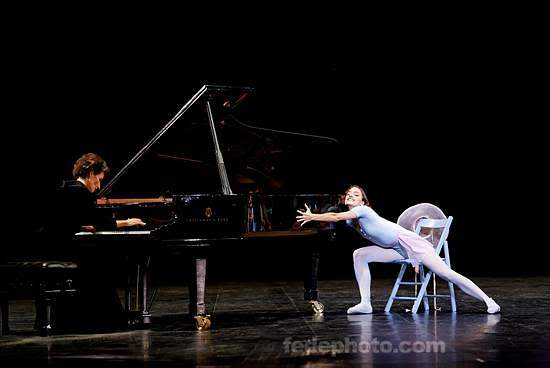 The pianist (Vessela Pelovska) and the ballerina (Dorothée Gilbert) in "The Concert." Life happened on the way to the theater so, suffice it to say, we arrived 45 minutes late. But life had been going on at the theater too, with a strike that held the curtain from going up on time. Surprisingly, we only missed the first piece of the Paris Opera Ballet's "Hommage à Jerome Robbins." The dancers cast in Jerome Robbins' The Concert, choreographed in 1956 with music by Frederic Chopin, clearly love this dance, and not only do they shine brightly in it, but they make the work shine too. If you haven't seen it before, The Concert begins with the entrance of the pianist, in this case Vessela Pelovska, who strides elegantly across the entire breadth of the stage to reach the piano where she seats herself. Her pride (or arrogance?) and the adjustments she makes are so natural, simple and precise that, if you are the tiniest bit gullible, it might be only after she dusts the keys off, blowing up a cloud of dust, that you can be sure the dance well and truly began with her first step onto the stage. The dancers themselves enter next, in the role of the audience with their folding wooden chairs, so quietly and properly placed, or not; the fellow with the noisy newspaper who is oblivious to the chagrin of his neighbors; the Ballerina so enamored of the music that she ultimately embraces the piano, resting her head on it to listen: or another who enters, coming in close, to sit straddled in her chair with her head in her hands, listening to the music through the filter of her own personal torment; the overbearing wife and a disinterested husband... Humanity spreads out before us, ourselves in fact, with life happening through the entire concert. Later in the work, the dancers take on the role of the performers, where we get a full palette of egos and ineptitudes, like the dancer who has to be seen, or the ones who don't know which leg they are supposed to be on or which direction they should be facing. 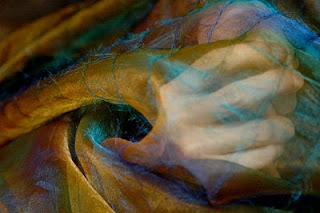 If you have ever danced in any of the classics, or have seen them performed over the years, you can't help but recognize and laugh at the senseless flapping (yes, yes, "wafting") of arms that seem disconnected from their bodies, in time but not in touch with the music. These same arms are later covered with swaths of fabric that resemble flags flapping in an irregular wind more than the butterfly wings they surely represent, and we are graced with a bit where the Queen of the Willis never makes it through the archway of wafting arms but ends up instead stretched dead beneath them, not even halfway through. Wonderful parody, of course, but the most beautiful thing about the work is that rather than looking down upon these blighted beings with judgment or disdain, we recognize and love them. Life not only happened on the way to the theatre, it happened in the theatre. The Paris Opera Ballet's performance of The Concert honored Jerome Robbins in the best possible way -- it made the work sparkle, with each performer (including the musicians) bringing their joyous light to the work individually to create together a brilliant performance of a brilliant work. The Natural Order of Things © Ann Moradian. All rights reserved. I am told that is the natural order of things. like a seed, and plant themselves beside the river's edge. in search of the river's source. photo copyright 2009. Nannette Bertschy and Ann Moradian. "Table Music" - Music or Dance? Where do you draw your line? 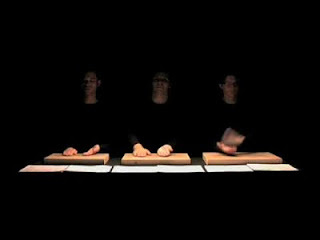 I found some excellent footage of Thierry de Mey's "Table Music" for ARTE television in France. Not only do I like the music presented here, I love the dance, and the questions the work raises for dance and for music. Click here to view.